New research untangles Mexican-American, Puerto Rican, and Cuban-American subgroups from overall alcohol use data about Hispanics. The study indicates that the risk of alcohol abuse and dependence can vary significantly among these different subgroups. Using pre-existing national data that looked at the incident rate of alcohol use disorders over a period of time, Carlos F. Ríos-Bedoya of Michigan State University reports that the annual incidence rate isn’t the same among all Hispanics and prevention efforts shouldn’t be the same either. Hispanics are one of the fastest growing populations in the United States and often have been identified as having a higher risk for alcoholism. Yet, Ríos-Bedoya counters that stereotype, showing that one group in particular, Cuban-Americans, has the lowest incidence rate—less than one percent—among their counterparts. They also are half as likely to develop a drinking problem than non-Hispanic whites. “Cuban-Americans typically come into America as political refugees with no threat of immigration laws and have been able to thrive and become part of mainstream society,” Ríos-Bedoya says. 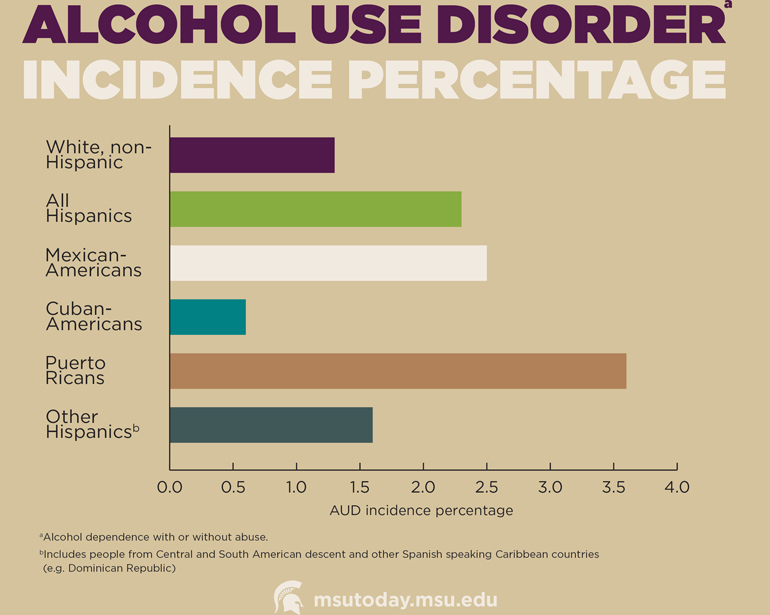 His study indicates the annual incidence rate of alcohol abuse among Mexican- Americans is more than twice that of Caucasians, with Puerto Ricans showing almost three times the risk. “Even though Puerto Ricans are born US citizens and have easy access back and forth between countries, they have a much higher risk factor in part because drinking starts at an earlier age and is a larger part of their culture growing up,” Ríos-Bedoya says. The legal drinking age in Puerto Rico is 18 years old. Ríos-Bedoya indicates that alcohol use is one of the most prevalent disorders in the United States and also one of the most costly, with more than $6 billion spent on treatment and prevention each year. He also adds that since birth rates are among the highest across the nation within the Hispanic population, it’s important to introduce preventive measures early and develop programs that are specific to each group’s differences. “The onset of this problem starts in young adolescence so it’s important that we start early,” he says. The study is available in the journal Alcohol and Alcoholism.